Every once in a while, an invention comes along that addresses a fundamental problem of our species. On the other hand, since we’ve successfully suffered through thousands of years of human history without a solution, you have to wonder how fundamental the problem actually is. The problem I’m thinking of arises when you visit a public restroom, though I suppose it can also happen at home. You step into the comfort station at the airport, Yankee Stadium, or your local movie house and see dozens of stalls. Some are occupied. Others aren’t. Some merely appear busy because their doors are slammed shut. Others look free but are occupied because their residents neglected to lock the door. So, how are you supposed to tell the difference? Enter Tooshlights, red-and-green traffic signals for the bathroom goer. Mr. Klevens said he was referring, in particular, to the swells with seats in the V.I.P. “Pool Circle” and the comfort station designated for their use. By trade, Mr. Klevens is a composer and musician; his business partner, Todd Bermann, is a contractor who works on the Hollywood Bowl’s audio/visual systems. That’s how Mr. Bermann became privy, no pun intended, to the issue. The way it works is that each stall is equipped with a sensor. “When the line of slight is broken it turns the light red,” Mr. Klevens said. Another option is to replace the existing locks with toosh locks that when turned shut will send a wireless signal to the ceiling light in front of that particular stall, turning it red. This is all very new, very cutting-edge. The company started only last month. However, Mr. Klevens reported that it has already lighted 85 stalls at the Hollywood Bowl. Other customers—the CEO said nondisclosure agreements prevent him from sharing names—include a 50,000-plus-seat stadium, a shopping mall group, and a company with more than 50 fulfillment centers. With Tooshlights they’ll be able to check availability without ever dismounting, thus enhancing productivity. It sounded wonderful, but I still had some troubleshooting questions. For example, what happens if someone enters the stall but neglects to lock the door, failing to trigger the sensor? This behavior happens routinely from my experience, for some mortifying reason often on airplanes. I couldn’t agree more. The first thing I do is bolt the door. It’s the only place to get privacy on airplanes these days. For however long I have the lavatory, I like to think of it as my little pied-à-terre. While red-and-green lights are universal signifiers, Mr. Klevens said there is no reason Tooshlights can’t be customized. To be honest, I still wasn’t totally sold on Tooshlights. It’s not that I deny there’s a need. But does it really rise to the point where you need to invest $700 to $800 a stall, by Mr. Klevens’s estimate, to install traffic signals? But then the CEO, who said the company is named after his daughter Jordan’s nickname rather than a generic posterior—”She had a cute little toosh when she was a baby”—shared part of their business plan that won me over completely. Sheer genius. And certain to become as visited on my iPhone as my flashlight or Google Earth app. For example, if I was at a Mets game and I knew that there were seven free stalls at the nearest men’s room and the Mets were down (or up) 9-0 with one out in the fifth, I might choose that moment to visit the restroom rather than wait to join the great Mississippi of fans descending on the comfort station between innings, sending the line snaking out the door. 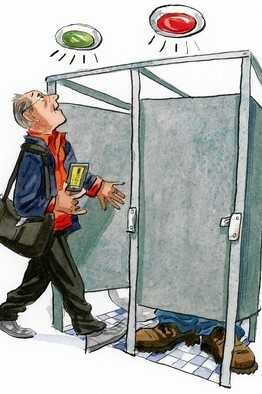 “If there are no stalls available,” Mr. Klevens explained, “you might click on the next bathroom.” Another 20-second journey might turn into a lifesaver. And, in any case, add immeasurably to your enjoyment of the game, whether your team wins or loses.